Mud Pie Sun are the Philadelphia based duo of Steve and Tom who first starting writing and recording together in 1989, inspired by the American and New Zealand underground DIY pop and home-recording ethos. Our introduction to their music here at Aural Innovations was the 2012 released Wooden Circle album which Alan reviewed at that time (CLICK HERE to read). 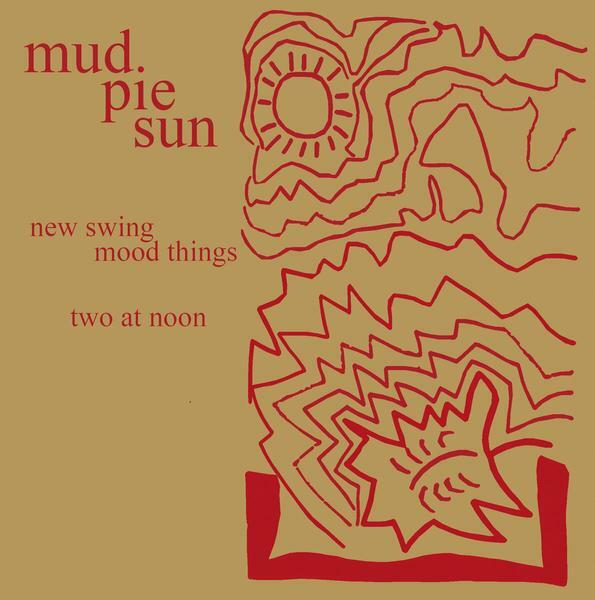 New Swing Mood Things / Two At Noon is a reissue of a cassette album from 1992, newly available in CD, cassette and download formats. The music is a sparse and acoustic driven lo-fi brand of Psychedelic Folk-Rock that across the album’s 13 songs include lots of outside the box surprises. At times I hear a blend of Acid-Folk and Psychedelic Bob Dylan, and at others solo acoustic Syd Barrett. But Mud Pie Sun can step far off the beaten path. Like on Any Minute, where the duo play a seemingly “normal” acoustic guitar singer-songwriter tune that just happens to be colored by whirring electronic tones followed by freaked out electric guitar effects. And Month Of Sundays, which has a similar core song sound but also tastefully dissonant electric guitar solo melodies which eventually builds up to a rollicking 60s flavored Folk-Pop-Psych song. Aztec Head is a weirded out Blues and tea kettle whistling sounds instrumental that I enjoyed. 5 Days After consists of drugged Psychedelic Folk-Blues plus traditional Americana elements. Where You Belong is one of my favorites… After a brief trippy looped effects intro the song portion kicks in with the acoustic guitar and vocals, but also an accompanying phased acid/angst/squall guitar, making for a raw but cool contrasting blend of melodic song and screeching anxiety, ultimately working up to a raucous rocking frenzy of rhythmically cohesive but clatterous Psychedelic chaos. Very cool. I like the raucous lo-fi 60s Folk-Rock of Sending Everything. The darkly somber acoustic Folk-Psych Blue Saturday varies the mood a bit. But Mud Pie Sun swing 360 degrees with the rousing Pop rocking jangle of Hurt Me More. And ditto for the guitar strumming Rock ‘n’ Roll of Revisited, that morphs into oddball but cool grooving avant-Psychedelic dissonance with dashes of Velvet Underground wildness. The music may be lo-fi but it’s recorded such that I felt like I had a front row seat in an intimate live setting. Damn good songs and lots of fun variety.